Sometimes my creativity takes me out of the studio and into the kitchen. So how about we go from Mayne Island to Morocco? 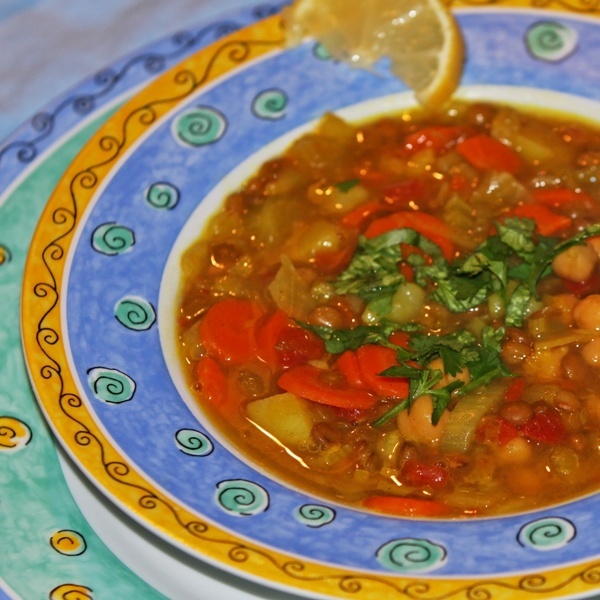 A few years ago I found the most delicious Moroccan soup in one of the Moosewood Restaurant cookbooks. 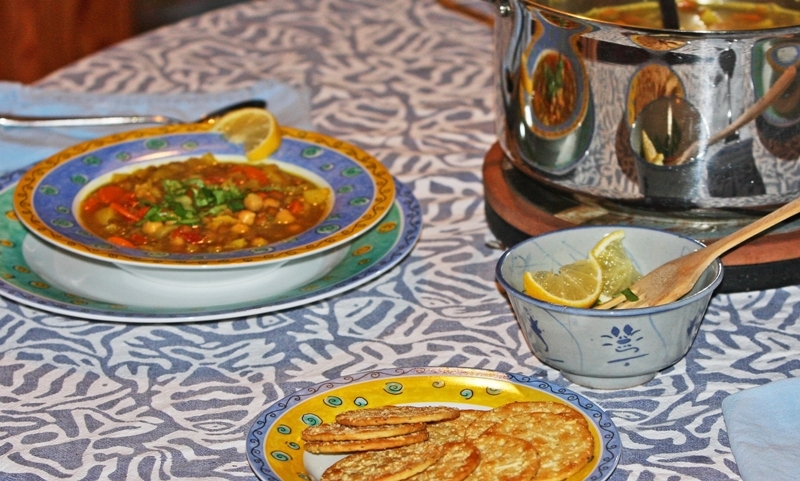 This Harira soup, in its many variations, is usually eaten to break the fast in the evening meal during the Muslim time of Ramadan which will begin on or close to July 20th in 2012. Just the smell of this fragrant soup being prepared has me smiling with satisfaction and delight. It is a great addition any time of the year to inspire freshness and renewal. I have made some adaption to the recipe, of course – as any creative person might. Sauté the onions in large a soup pot with a bit of olive oil. Add in spices and ginger. Then add carrots and celery followed by vegetable stock and potatoes and finally the tomatoes. Simmer until potatoes are tender. Now add lentils, chickpeas and saffron. Heat through but do not over cook. The celery will tell you when it is cooked just the right amount for you. Add Madeira, lemon, sea salt and pepper very last. Serve with fresh cilantro and lemon wedges and a smile. We had crackers too but you could have hard-boiled eggs on the side just as easily. Please feel free to substitute many items in this recipe while keeping the spices consistent. Small amounts of meat can be added such as beef, lamb or chicken. This time I added a little cabbage and it was a nice addition. I didn’t have enough onions so I used a shallot. Tomatoes are not in season so I used canned tomatoes and so on. But always keep the cinnamon, ginger, turmeric, saffron, lemon, fresh cilantro and the tiniest pinch of cayenne. Side note: this is one of the few soups that I make which tastes best on the day it is made. It is a large pot of soup so invite friends. Today is my daughter Josie’s birthday and I know how much she loves soup and foods that fill her senses with their natural goodness. Happy Birthday Josie! SPROUT: What foods fill all your senses with their natural goodness? Oh it is so good Jeff! And fast and easy to make as well. yeah well I just might cute and paste this to make later. I have a Moroccan cookbook, I don’t think I have ever made anything from it? I will make this in honour of Josie, and her birthday. We love soup as well. And by the way Terrill, I purchased your book Precious Seconds. What a lovely book. I will be happy to show it to our guests. You know Terrill, I can taste and smell the aroma of this soup from where I am presently sitting at the PC. We are all soup lovers in this house, and this recipe really brings together some healthful and delectable ingredients. No doubt that the first day is the best one to indulge in it, and what a lovely surprise for Josie on her birthday. Happy Birthday and bon apetite! As to the sprout I’d name a good lentil soup, escale and beans with garlic, and some fabulous home cooked tomatoe sauce, a la Lucille or my 81 year-old father, both of whom make a mean pasta dinner. My father is a master with eggplant parmigiana. Heck, Italians know some good dishes, no? Ha! Well I have to agree Sam Italians do know some pretty good dishes. For your gang I would suggest doubling this soup the first time if it has things in it that they like. It is easy to eat a couple of bowls and not feel like it too much. Ummmmm, me too, soup is my fave. Can’t wait to try this new one. I’ve been playing around with broth making for a while now, love to make a my own bases and then freeze them in ice cube trays and add a couple cubes to whatever I’m making – I’ll have to try that with this. Yes your own special stock would be perfect for this soup Alison. You will have to let us know how it works out. Terrill, what a beautiful recipe! Thank you for sharing…… it looks and sounds delicious (and uses some of our favorite combinations of flavors and spices). There are few things that are more heartwarming and soul satisfying than homemade soup. Many favorites in our house, including a spicy sweet potato soup we are just finishing off. Oh that spicy sweet potato soup sounds great too Colleen! So many soup lovers here – quite amazing actually. Ohhhhhhhhhhhhh, I can practically taste it and it’s delicious! And the photographs are equally scrumptious! Oh I love Thai food as well Laurie. Delicious! My warm, happy tummy will thank you too! You are most welcome Kit 🙂 Enjoy! Yummy good for a snowy day. I am making my chicken quinoa soup again this week, because I have all the ingredients and I just want to sit and enjoy the snow. It is mid afternoon and it has just stopped snowing! I bet this soup smells good – I passed it on to my other soup nut in the family. I have never hear of potassium broth before Patricia… what might this be? Your chicken quinoa soup sounds delicious too! Enjoy your snow. We got flurries but they are gone. It is cool enough that I pulled out my red wool dress sweater to wear with black slacks to friends for dinner tonight though. I can only wear this sweater when it gets close to freezing or cooler – otherwise it is just too hot. Terrill, the picture of the bowl caught my eye. I love, love, love those dishes!! And I have a soup I make that’s nearly the same in a Mediterranean cookbook I cherish. Yours has some differences that I’m going to try. Thank you for sharing this. As you probably know, I’m not a “foody” at all. I like simple fare. But this picture and recipe really hit the spot. You are most welcome Amber. I think you will find this dish simple and quick to prepare particularly after the first time you make it. The thing that is hardest is to make sure you have all the ingredients. YUM. I just saw your facebook post and now I’ve saved this into my Recipe folder. Those cold, dreary winter days we get in this part of the world will be a bit brighter and warmer for me now! (And your dishes…. *drool*) Thank you for sharing! You are most welcome Wendy and this is a perfect soup to bring celebration and warm to any number of dreary winter days.